Background: Diisocyanates are widely used in surface coatings, polyurethane (PUR) foams, adhesives, resins, elastomers, binders, and sealants. Isocyanate exposure is irritative to the skin, mucous membranes, eyes, and respiratory tract. The most common adverse health outcome associated with isocyanate exposure is asthma due to sensitization. Objective: The goal of this study is to find statistical predictive model to determine the relationship between airborne hexamethylene diisocyanate (HDI) and selective psychrometric variables. Materials and Methods: All air samplers (by midget impinger) were collected by mini personal sampler pump fixed to work stations near the source of pollution. The air samples and psychrometric parameters were separately collected and determined in a working shift for three periods of 2 h, each at a flow rate of 2 l/min in an impinger containing a solution of reagent of dimethyl sulfoxide in tryptamine [US National Institute of Occupational Safety and Health (NIOSH), 1994]. Results: There was a significant correlation between HDI concentration and relative humidity and dry bulb temperature (P < 0.05). No significant correlation was seen between altitude and dimension of PUR factories (P > 0.05). Conclusions: The finding of the study may be a useful initial tool in estimating possible HDI pollution situation in the PUR workplaces, based on simple psychrometric factors (indoor air temperature and relative humidity). Nowadays, the modern work style in the industries has brought into use all the chemical materials and high toxic materials in production process. Use of chemical materials in the workplace causes indoor air pollution problems. Aromatic diisocyanates such as methylene diphenyl diisocyanate (HDI) are extensively used in the manufacture of polyurethane (PUR) products. The main PUR products are flexible and rigid foam; other applications are as adhesives, sealants, binders, surface coatings and more. The global production of diisocyanates is annually increasing. In Europe alone, it is estimated that over 70,000 employees are manufacturing isocyanates or PUR. The numbers of workers further processing the PUR products are not known. The exposure to isocyanates is complex and different in different applications. The lower molecular weight isocyanates tend to volatilize at room temperature, creating a vapor inhalation hazard. Conversely, the higher molecular weight isocyanates do not readily volatilize at ambient temperatures, but are still an inhalation hazard if aerosolized or heated in the work environment. The latter is important since many reactions involving isocyanates are exothermic in nature, thus providing the heat for volatilization. As exposure limits decrease, the volatility of solid materials becomes an issue. To reduce the vapor hazards associated with the lower molecular weight diisocyanates, prepolymer and polyisocyanate forms of these diisocyanates were developed and have replaced the monomers in many product formulations. An example is HDI, which consists of three molecules of HDI monomer joined together to form a higher molecular weight oligomer having similar characteristics to those found in the monomer. The specific goal of this study is to answer the following question: How does the HDI concentration change with respect to psychrometric and factory factors? The correlation and regression analysis techniques are useful in investigating these relationships. The relationship between meteorological parameters and pollutant concentrations has been well studied in different parts of the world for different time periods. A lot of research has been devoted to the study of the local climatic conditions in relation to the air quality. Dickson, for example, studied the relationship between precipitation and particulate matter in Nashville, whereas Sham used a linear correlation to model respirable dust particulate and average wind speed in Malaysia. Of the PUR factories, 5 HDI factories were selected which had 450 workers, for this study; all of them manufactured foaming or PUR foams. The predominantly used isocyanate was HDI. There were 200 unexposed workers who worked in the office area. The sampling and analysis of isocyanates are divided into four steps: collection, derivatization, sample preparation and identification. The samplers have been evaluated for aspiration efficiencies and internal losses. All of the samplers with midget impinger were connected to mini personal sampler pump fixed to workstations near the source of pollution. The air sample was collected for 2 h at a flow rate of 2 l/min, in the impinger containing a solution of reagent of dimethyl sulfoxide (DMSO) in tryptamine. Because DMSO is readily absorbed through the skin, US National Institute of Occupational Safety and Health (NIOSH) recommends that DMSO impingers be used for area air sampling only. Reversed-phase high performance liquid chromatography (HPLC) has been the dominant separation technique used in isocyanate analysis. The first step in the analysis of a solution is derivatization of isocyanates for the separation through HPLC, for their qualitative as well as quantitative analysis. Air sampling was performed according to NIOSH method 5522 for isocyanate in air. Air samples were collected at a flow rate of 2 l/min using a midget impinger sampler (SKC, Eighty Four, PA, USA) and personal sampling pumps were calibrated before and after sampling with a Dry Cal DC-Lite primary flow meter (Bios International Co., Pompton Plains, NJ, USA). A KNAUER HPLC was used for air analysis. The HPLC equipment consisted of a high-pressure pump, a variable-wavelength UV detector and a loop injector; HPLC columns were made of stainless steel (200 mm long × 5 mm in inside diameter) packed with 5 m Nucleosil C18. The air concentrations of HDI were monitored continuously by the midget impinger instrument using DMSO with tryptamine reagent and the sampling time for HPLC analyses was 1 h at an air flow rate of 2 l/min. During air sampling for HDI concentration inside the factories, data for indoor relative humidity, indoor dry bulb temperature, altitude and dimension of factory were recorded. HDI was considered as a dependent variable and the rest were independent variables. These independent indoor air variables were divided into two groups. One was the indoor air psychrometric parameters involving the relative humidity (Rh, %) and the dry bulb temperature (Td, °C). The other group was the factory parameters involving the factory dimension in terms of factory space (D, m 3 ) and the altitude of factory location (Alt, m). B 0 , B 1 , B 2 , B 3 and B 4 are the model coefficients, and e i is the residual error. The values for the constant and the coefficients are determined using the least-squares method which minimizes the error as "e" in the above regression equation. The significance levels of the constant and coefficients are statistically tested using t-distribution. The R 2 (coefficient of determination) determines the direction and significance level of relation between the variables in the mathematical model and shows how much the dependent variable is affected by the independent variables. [Table 1] shows the maximum, minimum and mean values of indoor air independent variables with respect to HDI concentration in the PUR factories for 100 air samples which were gathered from workplaces separately by static sampling procedure. The lowest minimum HDI concentration in all the factories was 61 μg/m 3 and also the highest of the maximum HDI concentration was 96 μg/m 3 . These values can be considered as high, when compared to NIOSH exposure limit of 35 μg/m 3 . The mean HDI concentration was 78.8 μg/m 3 , the mean indoor relative humidity was 37.7%, and the mean dry bulb temperature was 28.3°C. The size of workplace for the five PUR factories ranged from 5000 to 9800 m 3 and the altitude of factories was from as low as 22 m to as high as 1200 m.
It has been summarized and stated in [Table 1] that several factories show variable concentration of diisocyanates, with respect to relative humidities of each factory. The highest mean value HDI concentration was 82.2 μg/m3 which corresponds to the highest mean relative humidity of 40.5% inside factory H 1 . Factories H 1 and H 2 were located in Tehran province. Factory H 2 had the second highest mean HDI concentration and also the second highest mean relative humidity (79.8 μg/m3 and 40%, respectively). Factory H 5 had the lowest mean value HDI concentration which was 76.7 μg/m3. Factory H 5 was situated in Mazandaran province and this factory had the lowest mean relative humidity of 34%. [Table 1] also summarizes that several factories have variable concentration of diisocyanates with respect to different dry bulb temperature. In factory H 1 , the highest mean HDI concentration was 82.2 μg/m3 and this corresponds to the highest mean dry bulb temperature of 29.3°C. Similarly, in factory H 5 , the lowest mean HDI concentration was 76.7 μg/m3 which corresponds to the lowest mean dry bulb temperature 27.1°C. Multiple regression analyses were performed to determine the psychrometric variables and other factors that explained the most variance in the overall data. The results of application of correlation coefficients and regression analysis are listed in [Table 2] and [Table 3]. From [Table 2], it is seen that relative humidity also correlates positively with HDI concentration. A significant relationship was found between HDI concentration and relative humidity in the PUR factories. The relative humidity in the study area was more than 34% on the average. Therefore, higher relative humidity corresponds to a greater concentration level of HDI in the PUR factories. A correlation between HDI concentration and dry bulb temperature yields a significant positive relationship. This implies that increased dry bulb temperature in the workplaces corresponds to high levels of HDI concentration. No correlation was seen between HDI concentration and dimension of workplaces. The correlation coefficient, however, is less and statistically not significant at 0.142 level, but negative. The correlation between HDI concentration and altitude did not show any relationship. No significant relationship was found between HDI concentration and altitude. The results imply that all or some of parameters (altitude, dimension of factory, relative humidity and dry bulb temperature) can be significant predictors of HDI concentration in the PUR workplaces. [Table 4] presents an analysis of variance for HDI concentration in the PUR factories. From the table, it can be seen that F is 121.9 which is significant at P < 0.05. We can conclude that the regression model predicts the concentration level of HDI significantly well. Since the results of regression model test in [Table 4] illustrate that the independent variables are significant predictors of HDI concentration, we can employ equation (1) to stand for the different psychrometric and factory parameters in order to measure the predictive regression correlation between the parameters and HDI concentration. [Table 5] shows the results of regression analysis between HDI concentration and PUR indoor air parameters. Both indoor relative humidity and dry bulb temperature can be seen to be significant predictors of HDI pollution (P < 0.05). Both these parameters fall under the psychrometric parameters group. The other two parameters (factory dimension and altitude) are the factory parameters and both are not significant (P > 0.05). This means that the size of HDI PUR factories and geographical positions of the factories in terms of altitude are not significant where the HDI pollution is concerned and are therefore taken out from the regression model. The independent variables (relative humidity and dry bulb temperature) were reproduced for the model to find the regression coefficients for HDI pollution in the PUR factories. The coefficients with respect to the constant, relative humidity and the dry bulb temperature as well as the collinearity statistics are shown in [Table 6]. Equation (2) implies that relative humidity and dry bulb temperature affect diisocyanates pollutant concentration in the workplaces. The background HDI concentration was about 27.77 μg/m3, as indicated by the value of the constant in the regression equation. 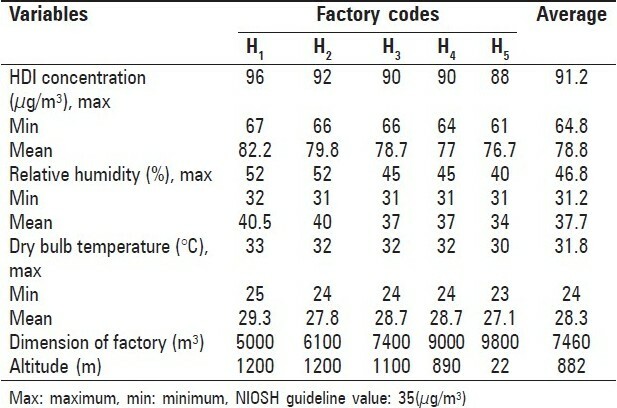 [Figure 1] shows the relationship between HDI concentration and psychrometric parameters (relative humidity and dry bulb temperature) in five PUR factories based on equation (2). 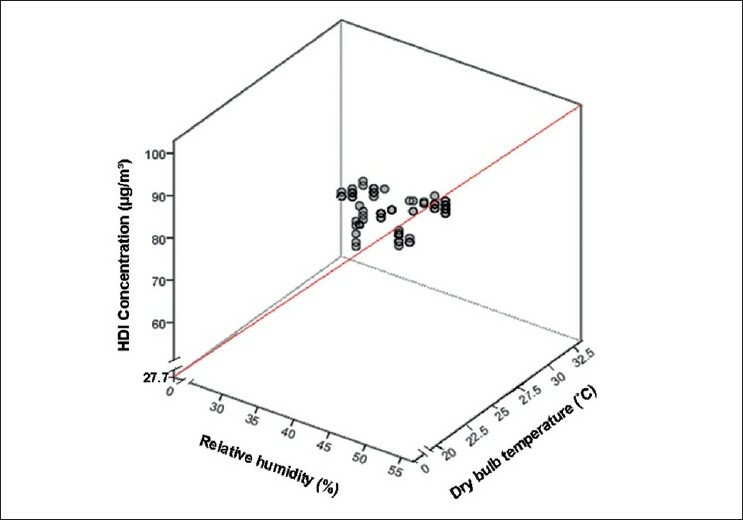 Both indoor air relative humidity and dry bulb temperature significantly contribute to the variability of the HDI concentration (R 2 = 0.837) and both factors also show a straight positive relationship with the HDI concentration. This means that as the indoor relative humidity or the dry bulb temperature increases, the HDI concentration also increases. Equation (2) (also shown in [Figure 1]) suggests that the average background HDI concentration was about 27.77 μg/m3, as indicated by the value of the constant in the regression equation. Heitbrink et al. studied psychrometric factors and diisocyanates in different PUR factories. They stated that there is a relationship between high concentration of diisocyanates and exposures for workers. In general, direct comparison of the results of present study with those of previous studies is quite difficult. Woskie et al. observed a number of reasons for this, such as often the sampling times are quite different, the results were described with a variety of descriptive statistics (arithmetic means, geometric means, etc. ), the aims of the studies varied greatly (sampler comparisons, method evaluations, surveillance and epidemiology) and the studies were conducted in different countries, covering different periods. Furthermore, in such studies, many different materials were used as calibration for standards and different units were used to express the exposure concentrations. The results of indoor air monitoring in all the five Iranian PUR factories showed high HDI concentration values, in comparison with NIOSH exposure limit of 35 μg/m 3 . The HDI concentration ranged from 62.24 to 92.7 μg/m 3 with a mean HDI concentration of 78.8 μg/m 3 . The background HDI concentration was about 27.77 μg/m3, as indicated by the value of the constant in the regression equation. The current work admittedly has limitations but may be a useful initial tool in estimating possible HDI pollution situation in the PUR workplaces, based on simple psychrometric factors (indoor air temperature and relative humidity). It can serve as a basis of future evaluation and intervention efforts to reduce the workers to isocyanate exposure. The authors gratefully acknowledge the technical and financial support provided by Iranian Ministry of Health and Medical Education, Medical University of Mazandaran and University Science Malaysia. 1. Harris AT, Davidson JF, Thorpe RB. A novel method for measuring the residence time distribution in short time scale particulate systems. Chem Eng J 2002;89:127-42. 3. Alshibli KA, Sture S. Sand shear band thickness measurements by digital imaging techniques. J Comput Civil Eng 1999;13:103-8. 4. NIOSH. Determination of airborne isocyanate exposure (1994). Chapter K. NIOSH manual of analytical methods, 4 th ed. Cincinnati, OH: U.S. Department of Health and Human Services, Public Health Service, Centers for Disease Control and Prevention, National Institute for Occupational Safety and Health, DHHS, Publication No. 94-113. 5. Roemmelt H, Fruhmann G. Respiratory and other hazards of isocyanates. Int Arch Occup Environ Health 1994;66:141-52. 6. White J. MDHS 25 Revisited; Development of MDHS 25/3, the Determination of Organic Isocyanates in Air. Ann Occup Hyg 2006;50:15-27. 7. Tinnerberg H, Sennbro C. Assessment of exposure to aromatic diisocyanates air or biological monitoring. IOHA 2005 Pilanesberg: Paper G1-4, 2005. 8. Bahattin M, Ibrahim K. The relation between meteorological factors and pollutants concentrations in Karabük City. G.U. J Sci 2007;20:87-95. 9. Marek W, Potthast J, Marczynski B, Mensing T, Baur X. Subchronic exposure to diisocyanates increases guinea pig tracheal smooth muscle responses to acetylcholine. Respiration 1999;66:156-61. 10. Molander P, Levin JO, Ostin A. Harmonized nordic strategies for isocyanate monitoring in workroom atmospheres. J Environ Monit 2002;4:685-7. 11. Dalene. Determination of airborne isocyanates as di-n-butylamine derivatives using liquid chromatography and tandem mass spectrometry. Analytica Chimica Acta 2004;534:263-9. 12. Wiley. Encyclopedia of biostatistics. Available from: http://www.wiley.com/legacy/wileychi/eob/publicity.html [last cited on 2009]. 13. Wirts M, Grunwald D, Schulze D, Uhde E, Salthammer T. Time course of isocyanate emission from curing polyurethane adhesives. Atmos Environ 2003;37:5467-75. 14. Vilhelm, Jan. (2001) Isocyanates: Risk assessment and preventive measures. Meeting of the Nordic supervisory authorities in Copenhagen on 27 April 2000. 15. Ludwig BW, Urban MW. Quantitative determination of isocyanate concentration in crosslinked polyurethane coatings. The Journal of Coatings Technology. Available from: http://www.superiortire.com [last cited on 1996]. 16. Abram ER, Bowler N. Effect of relative humidity on the curing and dielectric properties of polyurethane-based composites. This paper appears in: Electrical Insulation and Dielectric Phenomena, 2005. CEIDP ′05. 2005 Annual Report Conference on Publication Date: 16-19 Oct. 2005. 17. Holdren MW, Spicer CW, Riggin RM. Gas phase reaction of toluene diisocyanate with water vapor. Am Ind Hyg Assoc J 1984;45:626-33. 18. Pisaniello DL, Muriale L. The use of isocyanate paints in auto refinishing: A survey of isocyanate exposures and related work practices in South Australia. Ann Occup Hyg 1989;33:563-72. 19. Torling G, Alexandersson R, Hedenstierna G, Plato N. Decreased lung function and exposure to diisocyanates (HDI and HDI-BT) in car repair painters: Observations on re-examination 6 years after initial study. Am J Ind Med 1990;17:299-310. 20. Janko M, McCarthy K, Fajer M, van Raalte J. Occupational exposure to 1, 6-hexamethylene diisocyanate-based polyisocyanates in the State of Oregon, 1980-1990. Am Ind Hyg Assoc J 1992;53:331-8. 21. Maitre A, Berode M, Perdrix A, Stoklov M, Mallion JM, Savolainen H. Urinary hexane diamine as an indicator of occupational exposure to hexamethylene diisocyanate. Int Arch Occup Environ Health 1996;69:65-8. 22. Maitre A, Leplay A, Perdrix A, Ohl G, Boinay P, Romazini S, et al. Comparison between solid sampler and impinger for evaluation of occupational exposure to 1,6-hexamethylene diisocyanate polyisocyanates during spray painting. AIHA J 1993;57:153-60. 23. Heitbrink WA, Wallace ME, Bryant CJ, Ruch WE. Control of paint overspray in autobody repair shops. Am Ind Hyg Assoc J 1995;56:1023-32. 24. Woskie SR, Sparer J, Gore RJ, Stowe M, Bello D, Liu Y, et al. Determinants of isocyanate exposures in auto body repair and refinishing shops. Ann Occup Hyg 2004;48:393-403. 25. Yassen ME. Analysis of climatic conditions and air quality observations in Kuala Lumpur and Petaling Jaya, Malaysia, during 1983-1997. MPhil Thesis. 2000. 26. Sánchez-Ccoyllo OR, de F. The influence of meteorological conditions on the behavior of pollutants concentrations in Sao Paulo, Brazil. Environ Pollut 2002;116:257-63. 27. Cuhadaroglu B, Demirci E. Influence of some meteorological factors on air pollution in Trabzon city. Energy Buildings 1997;25:179-84.